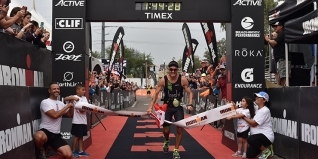 The 2016 IRONMAN World Championships may not have gone to plan for the Canadian pairing of Lionel Sanders and Brent McMahon, but they bounced back to form, showing their true capabilities on Sunday in Arizona with two super-fast Sub-8 hour performances. Indeed, the 7:44:29 winning time from Sanders represented a new 'best' time under the IRONMAN™ umbrella, the third fastest ever over the iron-distance to the Challenge Roth performances of Jan Frodeno (7:35:39, 2016) and Andreas Raelert (7:41:33, 2011). The early pace in the swim saw Rafael Goncalves (BRA) take a more than one minute lead with a swift 45:31 time, Matt Chrabot (USA) next through in 46:39 and then McMahon (48:21), before the first real group around four minutes back which included Philip Graves (GBR), Cameron Wurf (AUS), Pete Jacobs (AUS) and TJ Tollakson (USA) amomgst its members. As is typical, Sanders were further back in 53:45 - though 'only' a four minute deficit to some quality athletes, to me, represents a step forward in his progress as a swimmer. Austrlian Wurf set the pace on the bike. A true all-rounder, he was initially an Olympic Rower (2004), then a Pro cyclist, riding the Vuelta and Giro, and now Pro triathlete. He would finish with a 4:05:45 bike split, bettered only by Sanders who clocked 4:04:38. Wurf reached T2 alone, with Sanders having ridden through the field and two and a half minutes back starting the marathon. Tollaksoin was third into T2 (4:25 behind), with Philip Graves and Giulio Molinari (ITA) next, 7:19 back. Sanders wasted little time in taking the lead, as Wurf would fade to a 3:28 marathon. While Brent McMahon managed to run slightly quicker than Sanders (2:40:17 to 2:42:31), it would be Sanders who crossed the line first - as he did 12 months ago - to take the win, $20,000 first prize and to set a new best time within and IRONMAN sanctioned full distance event. Sanders ran through for second with Tollakson completing the top three. After a solid swim and bike, Graves faded back to 20th Pro with a 3:32:21 marathon. Super swimmer Meredith Kessler produced a gun-to-tape victory - her third consecutive win in Arizona, but that alone doesn't tell the story of what was a tough race. Eight and a half minutes back in the swim, Yvonne Van Vlerken (NED) gained back almost four minutes on the bike, and then set about trying to close the rest during the marathon. As the two were evenly matched, at times Van Vlerken managed to get close with a lead change perhaps set to happen during the second half of the run, but Kessler held strong and reached the line three minutes clear, the pair running 3:09:40 and 3:08:43 respectively. In third place, Canada's success continued as Malindi Elmore became the latest athlete to join the female all-time sub-nine hour iron-distance listing. Great Britain's four-time world champion Leanda Cave ended her season with a fifth place finish, despite going into the race with a cold.